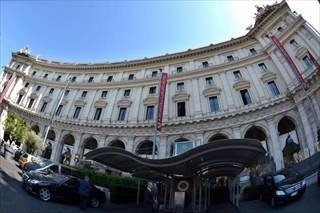 Hotel Exedra where James Gandolfini died. I rarely think about it, but someone died many years ago in the third bedroom of my New York apartment. Of course, the bedroom at the time belonged to my elderly neighbors. I don’t know exactly what happened, but the wife wasn’t in such a rush to have her deceased husband removed. She slept beside him for a few days. We lived next door and didn’t see, hear, or smell a thing. The wife moved away soon after. The apartment had a few renters since then, but they didn’t last. When the building went co-op thirty years ago, we bought that apartment plus ours and connected them. Death or no death, I wanted the additional space. Usually, I would be a little skittish about it, but greed took over. The two apartments together were a New York dream. That wasn’t the case for celebrity chef, Sandra Lee, who abruptly ended her stay in the same Rome hotel room where “Sopranos” star James Gandolfini died suddenly three days earlier. The minute she found out, she fled. The girlfriend of Governor Andrew Cuomo claims she didn’t want any part of the media frenzy — but we imagine we know differently. 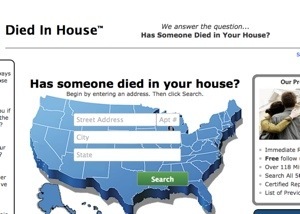 Just in case you also are feeling a little uneasy about your current abode, or could swear you have been hearing disturbances for a while, check out DiedInHouse.com. A single search costs $11.99. There is a disclaimer on the site which absolves them of any inaccurate information. I wouldn’t let that dissuade me from using the service. Lawyers always try to protect their clients. This entry was posted in digital, senior lifestyle, tech and tagged death, DiedInHouse, ghosts by loiswhitman. Bookmark the permalink. Creating that site seems like quite an undertaking. No paranormal activity here, just critters hanging out by my creek. I’m dying to sleep in your third bedroom, could use the excitement at my age!